The rotary_encoder sensor platform allows you to use any continuous-rotation rotary encoders with ESPHome. These devices usually have two pins with which they encode the rotation. Every time the knob of the rotary encoder is turned, the signals of the two pins go HIGH and LOW in turn. 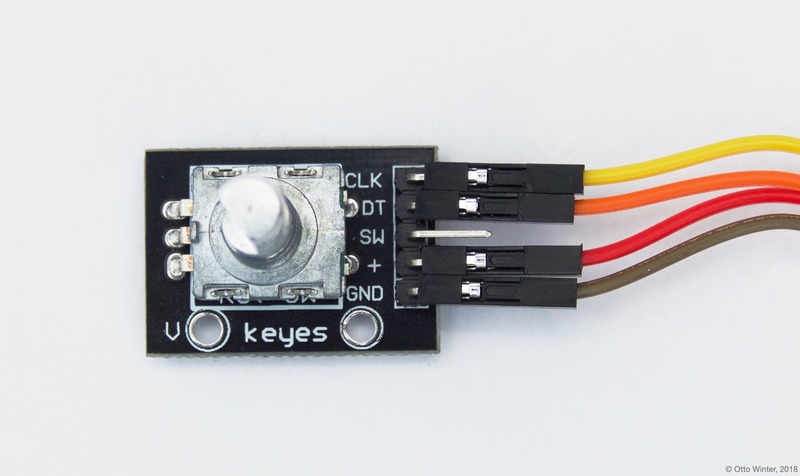 See this Arduino article to gain a better understanding of these sensors. Example of a continuous rotary encoder. Pin + is connected to 3.3V, GND is connected to GND, and CLK & DT are A & B. To use rotary encoders in ESPHome, first identify the two pins encoding th step value. These are often called CLK and DT as in above image. Note if the values this sensor outputs go in the wrong direction, you can just swap these two pins. pin_a (Required, Pin Schema): The first pin for determining the step value. Must not be a pin from an external I/O expander. pin_b (Required, Pin Schema): The second pin for determining the step value. Must not be a pin from an external I/O expander. name (Required, string): The name of the rotary encoder sensor. pin_reset (Optional, Pin Schema): An optional pin that resets the step value. This is useful with rotary encoders that have have a third pin. Defaults to no reset pin. min_value (Optional, int): The minimum value this rotary encoder will go to, turning the knob further will not decrease the number. Defaults to no minimum. max_value (Optional, int): The maximum value this rotary encoder will go to, turning the knob further will not increase the number. Defaults to no maximum.